AFC Leopards, the 2013 GOtv Shield champions will face Kariobangi Sharks in the final of this year’s tournament. They overcame a hard fighting Vihiga United 1-0 while Kariobangi Sharks knocked out SoNy Sugar 2-0 to reach their first ever Shield final. Both matches were played on Sunday at the Afraha Stadium in Nakuru. Ingwe were made to work hard by National Super League side Vihiga United but Burundian forward Alex Kitenge scored a penalty five minutes from time. “Vihiga is a very organized and well oiled team and the win today was not easy. I am happy we have made it to the final because that was our main objective when I came into the team. Now we have to go in and complete the job,” Robert Matano, the AFC Leopards head coach said. Edward Manoah, the Vihiga United boss admitted that at the end of the day, his team failed to make it because of lack of experience. “We had close to four open scoring chances in the first half and about two in the second which we should have buried. We were punished for a mistake at the back and I am disappointed we had to exit here because we had hopes for the final. But I am pleased because this season we have done well and this is the first time we have come this far,” the tactician said. Vihiga started the match with pace and confined AFC Leopards into their own half. Their biggest undoing was lack of finesse in the final third. Clyde Nevade had a golden opportunity at the edge of the box in the third minute after a weak clearance by AFC Leopards’ clearance from a cross. But, the Vihiga United midfielder’s shot went wide. In the 17th minute, former Ushuru forward Dennis Wafula had a header at the far post from a Nevade cross, but it didn’t trouble Ingwe custodian Ian Otieno. The NSL side were using their height to try and unlock the AFC Leopards defense, but couldn’t hit the bulls eye. Otieno was called into a great save in the 20th minute when Rashid Kyambadde slapped the ball on target first time after being put through by Kevin Ichiami. AFC Leopards’ first shot on target after being heavily subdued was after the hour when Kitenge swiftly turned away from his markers on the left before unleashing a venomous shot. However, Barnabas Tiema, the Vihiga United shot stopper gathered at the near post. Five minutes to the break, Manoah’s charges should have gone ahead when Bernard Oginga controlled a dipping freekick from Edwin Otieno, but he could not get the ball into the net from six yards out. In the second half, AFC Leopards decided to go more offensive, Keziron Kizito and Marcelus Ingotsi coming on for Vincent Oburu and Whyvonne Isuza. They exerted pressure and Kizito had a chance to open the scoring in the 77th minute but he shot wide after being set up by Ndung’u on the edge of the box. The resilience paid off five minutes to time when Kitenge scored from the spot after a Vihiga United defender handled inside the box. In an earlier kick off, Massoud Juma scored twice for Kariobangi Sharks in a game of little chances to booked a ticket for their first Shield final. Juma took full advantage of mistakes by SoNy Sugar in either half to score. Last season, Kariobangi Sharks were knocked out at the same stage by Ulinzi Stars. “It is a huge improvement and I am pleased with the boys. We had worked for this and getting to the final is a huge achievement. We know it will be tough but we have that belief which has pushed us throughout this season,” William Muluya, the Kariobangi Sharks coach said. Juma opened the scoring in the 29th minute when he tapped the ball over advancing SoNy keeper Kevin Omondi. 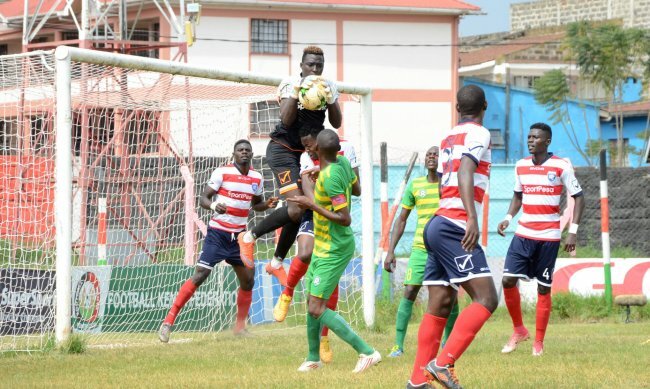 SoNy’s defense were caught in sixes and sevens when skipper Joseph Omweri missed a header from a Paul Kamau cross and Juma took advantage to score. SoNy piled pressure in the second half, but couldn’t threaten Kariobangi Sharks keeper John Oyemba. Yema Mwana had a perfect opportunity for the sugar millers in the 73rd minute when he dived in to meet a Samuel Olare cross, but missed it by an inch with a gaping goalmouth. SoNy were punished for their own mistakes, a miss-pass from Nick Akoko in the middle of the pack was intercepted by Kamau who sent Juma through, breaking into the box and blasting the ball into the net. Saturday: Posta Rangers 1 Thika United 1, Mathare United 0 Ulinzi Stars 1 (Ruaraka Complex), Kakamega 2 v Sofapaka 1 (Mumias), Tusker FC 0 Gor Mahia 2 (Kericho Stadium). Sunday: Bandari 0 Chemelil Sugar 1 (Mbaraki). GOtv Shield: Kariobangi Sharks 2 SoNy Sugar 0, AFC Leopards 1 Vihiga United 0 (Afraha Stadium, Nakuru).